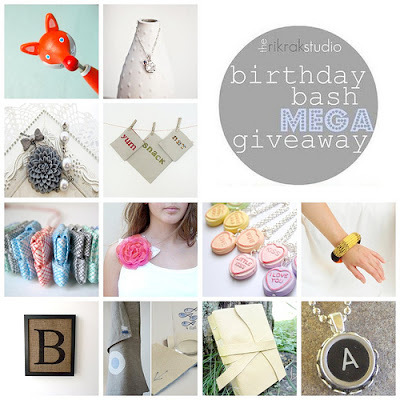 the rikrak studio: the 2nd annual MEGA birthday bash giveaway! it's my birthday this week, nicies! woohoo! so let's have a party! 1. visit my birthday bash giveaway sponsors' shops. come back here and leave ONE COMMENT PER SHOP on what your favourite item is from their fabulous shops! = 1 entry per comment. 2. tell us something YOU'RE celebrating these days! 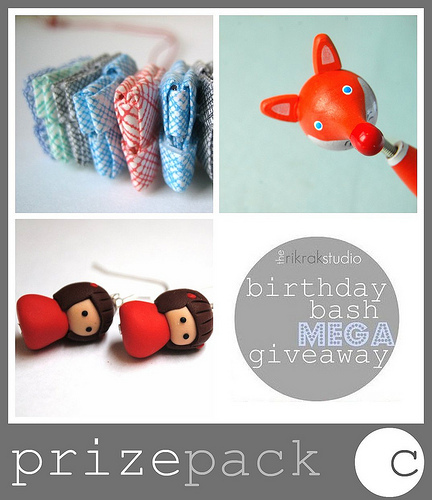 3. add each of the following shops to your FAVOURITES on etsy! = 1 entry per shop! 4. come follow or subscribe to each of the following BLOGS.= 1 entry for EACH blog you follow. 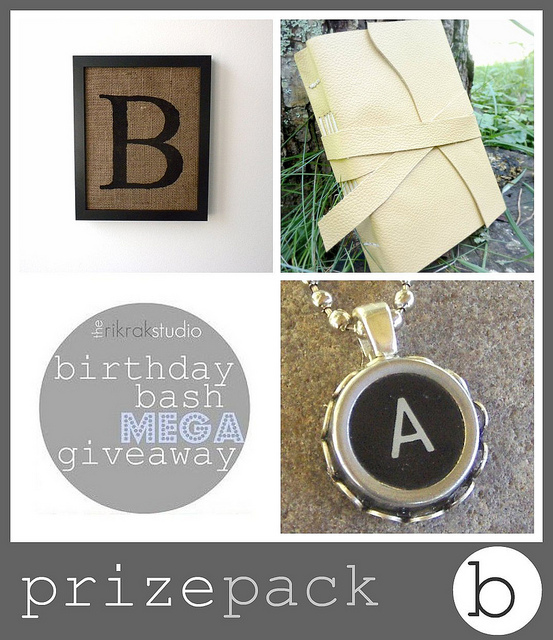 = you can tweet ONCE A DAY for the duration of the giveaway. up to 11 possible entries. one per tweet. = 1 entry PER person you follow. 8. friend each of the following on facebook. you can become a google friend connect *follower* by clicking "follow" on the top left of the blog home page OR subscribe via email or *reader* on the left hand colomn. 12. please just make sure that each entry is its own comment! friday, september 16th @ 11pm EST. 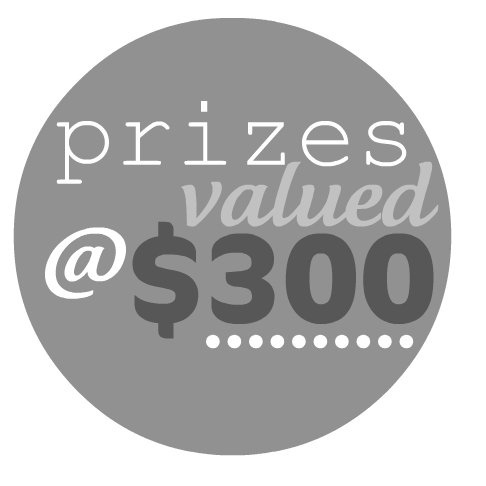 the first # drawn will win prize A. the 2nd # drawn will win prize B. the 3rd # drawn will win prize C.the 4th # drawn will win prize D.
f) thanks so much everyone! FAVE item...which I REALLY want! I "LIKE" Itchen Stichen on Facebook. I have been eyeing up a burlap "K" from LAX to YVR for awhile now! I've been a RIKRAK blog follower for awhile - welcome back and happy birthday! I follow your blog RikRak. Happy Birthday!! I'm a gfc follower of you :). From Itchin Stitchin, I love the Pleated Paisley Blue and White Country Chic Flannel Clutch or Small Purse. From LaAlicia, I love the Eco-Friendly Pin - Emerald Green Recycled Paper. From Lax To Vyr, I love the Ampersand stencil style on burlap wall decor. From Lilley, I love the Little Black Ninja With Sword! It's just sooo cute :). From Manus Made, I love the Wool Whale Stuffed Toy-adorable :). From My Handbound Books, I love... well, everything. because I love writing... but I think I'd choose the Exemplary - Faded Red Leather Journal :). of course I like the letter 'N' from LAX to YVR! fave item from MyHandboundBooks is the 'Comfort' Journal in Olive. Hey, it is my birthday this week also!!! By the way, I am a follower! Wish you a great week!!! I follow Buster & Boo's blog as doroffee. I follow Itchin Stitxhin's blog as doroffee. I follow La Alicia's blog as doroffee. I follow Lax ro Yvr's blog as doroffee. I follow My Handbound Books's blog as doroffee. I follow One Perfect day's blog as doroffee. I follow Space Jam's blog as doroffee. I follow kanelstrand via twitter as doroffee. I follow Itchin Stitchin via twitter as doroffee. I follow La Alicia via twitter as doroffee. I follow Lax to Yvr via twitter as doroffee. I follow Lilley via twitter as doroffee. I follow Manus Made via twitter as doroffee. I follow My Handbound Books via twitter as doroffee. I follow One Perfect Day via twitter as doroffee. I follow Yanessa B. via twitter as doroffee. I follow Itchin Stitchin via fb as Dorottya Zsófia Bacsi. I follow Kanelstrand via fb as Dorottya Zsófia Bacsi. I follow Lilley via fb as Dorottya Zsófia Bacsi. I follow Manus Made via fb as Dorottya Zsófia Bacsi. I follow My Handbound Books via fb as Dorottya Zsófia Bacsi. I added One Perfect day as a friend on fb as Dorottya Zsófia Bacsi. I follow Prairie Blossoms via fb as Dorottya Zsófia Bacsi. I follow Yanessa B. via fb as Dorottya Zsófia Bacsi. Now, this is what I call a celebration! Of course I blogged about it! And I posted it on fb but have no idea how to share that link......! Loving the medieval girdle book over on my handbound books. 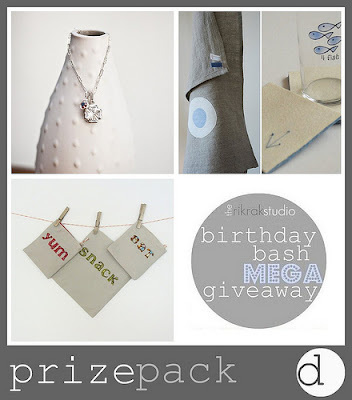 celebrating my 28th birthday soon! Happy Birthday!!!!! Love this mega giveaway!!!! My favorite item from busterandboo is http://www.etsy.com/listing/64136919/wooden-charm-necklace-theatrecircusmovie, I just love cats!!!! My favorite item from LaAlicia is http://www.etsy.com/listing/26565379/eco-chic-clutch-upcycled-magazine-and! I ADORE this earrings from Lilley! I just have to have this whale!!!! Manusmade is an amazing shop!!!! http://www.etsy.com/listing/60824406/ooak-geometric-eco-friendly-stocking-in from your wonderful shop!!!! This is so me spacejam!!!! busterandboo is in fav list! ItchinStitchin is in fav list! kanelstrand is one of my fav shops! This is my fav from Buster and Boo! I am a subcriber through RSS! I follow your blog as akamatra! Love the Bullrush in grass silhouette linen pillow from manusmade. Cute shop! i am absolutely craving the mini book earrings in every color from MyHandboundBooks and the leather bound journals are gorgeous! Lusting the Flamingo Pink Organza Flower Corsage /Pin/ Brooch with antique white canvas leaves by OnePerfectDay.. Lovely shop! love the Marlene, sterling silver sparkle crystal earrings from yanessab. what a gorgeous shop! my fave thing at kanelstrand is thr apple cozy birdie! my favorite item from la alicia is this all season garland. Happy Birthday!! I blogged it! thanks!!! I celebrate moving to my new house! my fave item from itchin stitchin is the live laugh love dishtowel! my fave item is the enchanted forest may bracelet. gorgeous! my fave item from la alicia is liberated paper in sand, sea and sunset. 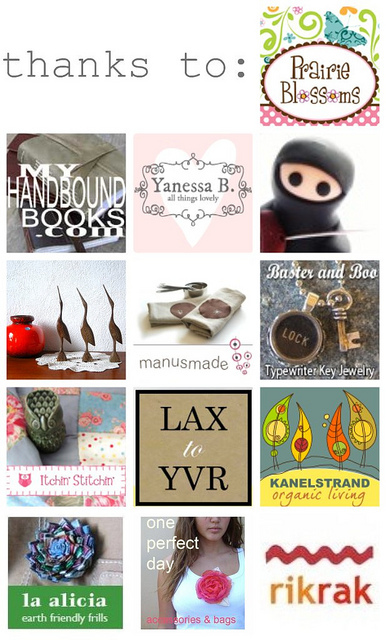 i hearted/faved lax to yvr's shop! my fave item from lax to yvr's shop is the letter J on burlap! i added manusmade to my favourites! my fave item from manusmade's shop is the firecracker red linen bar apron. i added myhandboundbooks to my favourites! i added oneperfectday's shop to my faves! 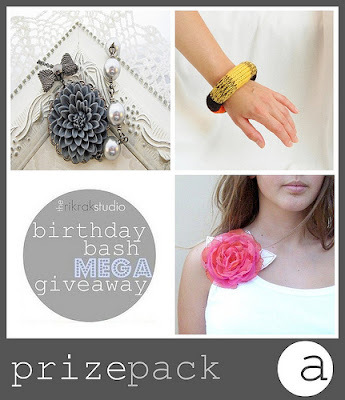 my fave item from oneperfectday's shop is the creamy magnolia cuff with metallic leaves. i follow! happy b-day by the way!